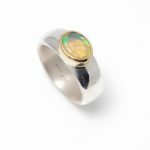 A wide range of rings from each of Alice’s collections, including many one off pieces. 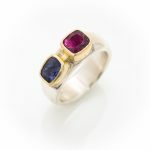 If you are interested in having a bespoke ring made then please contact Alice using the contact form in the main menu. Tiny tiny silver hinged box rings with tiny precious stones set in 18ct. 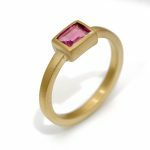 The square silver box has a lightly textured top and seven rubies set in 18ct gold. The box has a hinged lid and inside 4 letter cubes. 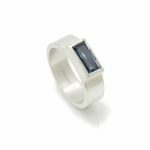 Ring size N1/2 The narrow silver rectangular box ring has 12 tiny blue diamonds set in 18ct gold. The box has a hinged lid and inside 4 letter cubes, one with a purple set sapphire. Ring size P1/2 Specific letters and word combinations available on request. Box ring commissions also welcome. 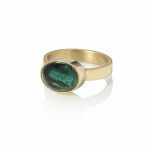 A beautifully simple 18ct yellow gold ring that just celebrates this gorgeous cabochon Green tourmaline. 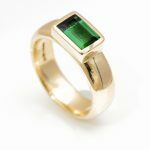 The tourmaline has real depth, its like looking into a deep green pool! 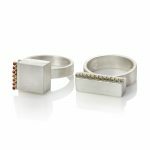 The band and setting are made from 18ct yellow gold in a simple flat ring style. Ring size O. Can be resized but this may incur an additional cost. 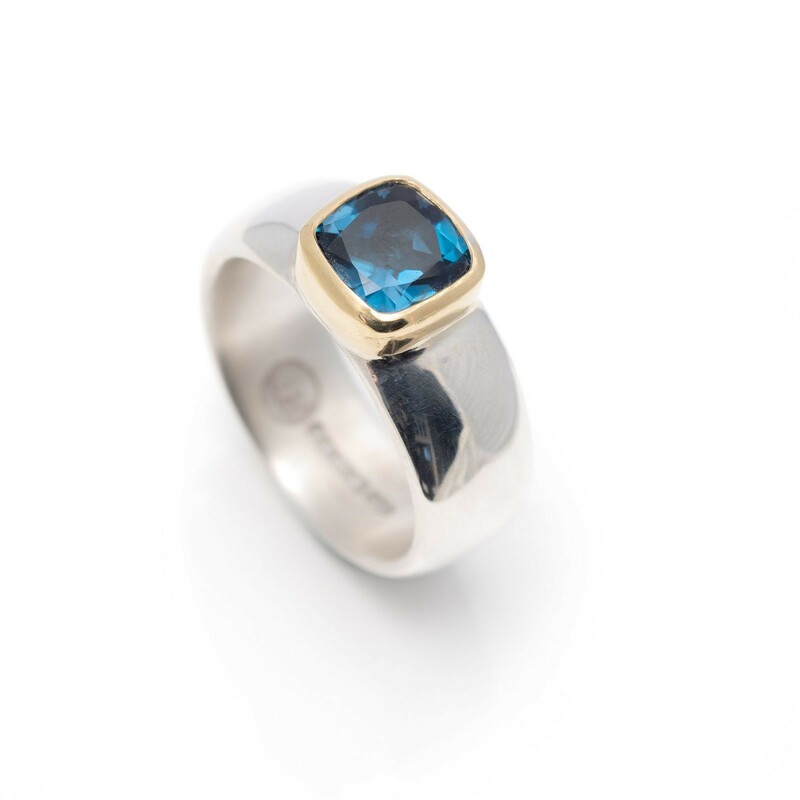 A simple and very contemporary wide silver flat ring with a rectangular London Blue Topaz. A unique kinetic ruffle ring with wonderful movement. 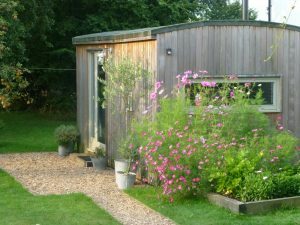 The small silver squares are each hinged allowing the squares to move from side to side. 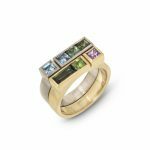 One of the centre squares is made from 18ct yellow gold. 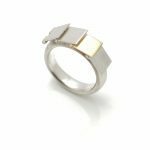 This ring should be worn with care and taken off while sleeping, exercising or any activity where the square could catch and be broken. 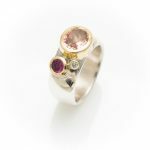 Another to add to the collection of my wide silver rings with semi precious stones set in 18ct gold settings. 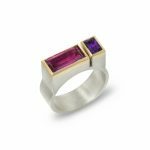 This one with a rectangular cushion Iolite and a square cushion shaped pink Rhodolite Garnet. Size M If you like this ring but it's the wrong size please contact me as I can make something similar in your size.